The Health First Roadmap is intended to provide specific guidance to cleaning product companies on chemical screening and safety. The roadmap outlines the key categories included in company chemical screening, and benchmarks from “compliance” to the “high road” the ways companies can make progress towards an approach that puts health first. Companies put human health and the environment first. The set of chemicals they allow in their products is very limited to only those that pose no potential health risks to consumers at any level, regardless of exposure pathways. They are transparent about their chemical screening efforts and criteria, and they lead collaborative efforts to move the cleaning products industry towards safer production. Companies ensure that their products do not contain chemicals of concern to human health or the environment. They stay ahead of regulatory changes by prohibiting chemicals deemed hazardous by any jurisdiction in the world and those that consumers and NGOs are concerned about, regardless of levels or exposure pathways. Companies take action by prohibiting or restricting chemicals deemed hazardous by any jurisdiction in the world, including any chemical for which new regulations emerge. They seek to make these changes across all cleaning products, regardless of levels or exposure pathways. Companies take no additional action to restrict or prohibit chemicals of concern than is currently required by law. They continue to use chemicals deemed hazardous in other jurisdictions. This section focuses on the corporate policies companies use to manage chemicals across all their brands, including goals for reducing chemicals of high concern, and whether progress has been made towards the meeting goals established in the policy. 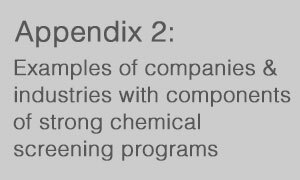 Company has a stated chemicals policy with goals for reducing chemicals of high concern and/or increasing the use of safer chemicals. Measuring a company’s use of chemicals of high concern in products and progress towards using safer alternatives. This includes participating in the Chemical Footprint Project (CFP) survey, and making the information public. Has a regularly updated restricted substances list (RSL). YES. General policy statement with some detailed information on chemical safety goals.Uses template or follows guidance established by BizNGO Model Chemicals Policy for Brands and Manufacturers. Company may have completed CFP survey, but has not established specific goals for improvement. YES. General policy statement addressing its commitment to reduce its use of hazardous chemicals, with little or no further information on goals, strategies or practices. Company has not completed CFP survey. Company has no written chemicals policy addressing its approach to reducing chemicals of high concern. Has not completed Chemical Footprint Project survey to assess its current approach to chemicals management or track current use of chemicals of high concern. Company has made progress on reducing or eliminating chemicals of high concern in products. Company has made measurable progress towards reduction and/or elimination of chemicals of high concern as compared to the goals stated in its chemicals policy. Completes Chemical Footprint Project survey to determine current use of chemicals of high concern and updates its policy to include additional measurable goals towards improving its chemicals management strategy, chemical inventory, and chemical footprint. No demonstrated progress towards goals of reducing hazardous chemicals, or did not set out measurable goals in its policy. This section encompasses specific approaches, methods and criteria for evaluating chemicals, determining chemicals of high concern to reduce or eliminate, and assessing alternatives to avoid regrettable substitution. Process company uses to determine chemicals of high concern to human health, the environment, or of increasing concern to consumers. This includes specific health and environmental endpoints considered, and how the company uses authoritative lists of chemicals of concern established by scientific and governmental organizations. Encompasses approaches to hazard and exposure assessments and criteria for eliminating chemicals and/or establishing thresholds for chemicals to be restricted. This is a central question in differentiating how one company defines “safe” compared to another. Chemicals identified as having hazard properties when run through GreenScreen List Translator and EPI Suite (where applicable). Making testing methodologies, data, findings, and all other relevant chemical assessment information available to the public. Chemicals identified by NGOs as being of concern to their constituencies. If any reasonably anticipated product use is relevant to the exposure concern, follow steps below. Establishes thresholds at which chemical will not be used that take into account the most vulnerable populations reasonably anticipated to be exposed to the product, including women in different stages of pregnancy and breastfeeding, infants and young children, children at different stages of puberty, people with different types and stages of cancer, and cleaning workers who have higher cumulative exposures to chemicals in cleaning products. When extrapolating risk from animal studies, applies a high standard for determining any potential risks to humans, including vulnerable populations described above. Makes testing methodologies, data, findings, and all other relevant hazard and exposure assessment information available to the public. If following risk assessment guidelines issued by government agencies (National Academy of Sciences, Environmental Protection Agency, World Health Organization), makes explicit how these tools are being used. Conducts exposure assessments on hazardous chemicals. Utilizes a limited range of dosage levels in testing process. Establishes thresholds at which chemical will not be used that do not take into account the most vulnerable populations, such as those described above, or does not establish firm thresholds at which chemical will not be used. When extrapolating risk from animal studies, does not apply a high standard for determining any potential risks to humans, including vulnerable populations described above. Based on exposure assessments, chemicals are routinely found to be safe at certain levels. At levels below which an adverse effect is observed for a limited array of health endpoints, and does not into full account vulnerable populations, including those described above. Does not takes feedback from academic researchers, NGOs, and other external parties to inform decision-making about chemical use. Where lack of data or insufficient data make hazard properties of a chemical difficult to identify, continues include the chemical on its palette, and use it in products. Chemicals that the company does not use or uses in restricted amounts in formulated products. Based on process described in 2A (above), the Restricted Substances List (RSL) a company develops constitutes the set of chemicals it is actively working to reduce or eliminate. Inclusive of chemicals prohibited or restricted by law in any jurisdiction, AND chemicals with hazard properties not currently prohibited or restricted by law, AND chemicals for which no or insufficient safety data exist. Prohibits chemicals of high concern (COHC) identified and evaluated in 2A DO NO HARM above. Only at levels below which ANY adverse effect is observed for ANY relevant health endpoint and taking into account vulnerable populations, including those described above. Places a moderate number of chemicals on the list of prohibited chemicals, and/or this list remains stagnant for many years. When replacing a chemical with an alternative, company has a commitment to and process for assessing alternatives to identify safer substitutes and avoid regrettable substitution. Also addresses the criteria by which enough reports of adverse reactions from product users prompt additional action, including reformulation, redesign, and product discontinuation. Uses an equally rigorous process for assessing chemical alternatives and identifying safer alternatives. This process would need to be made public so that external parties can verify level of rigor. Has an internal system for tracking adverse reaction reports, but does not consider reformulation based on such reports, and does not share reporting data externally. Does not have a stated commitment to or process for avoiding regrettable substitutes when phasing out chemicals of high concern. Does not consider taking further action based on adverse reaction reports, including reformulation, redesign, and product discontinuation. Standards and practices company uses to ensure that commitment to chemical and product safety incorporates fragrance chemicals, whether the company is a formulator or contracts with external fragrance suppliers. Goes beyond IFRA standards to evaluate fragrance ingredient safety, identify fragrance COHCs, and make progress towards eliminating them as described in 2A-C DO NO HARM levels above. Fragrance palette is narrower than IFRA list. Does not conduct full assessments of all fragrance chemicals on its palette to identify a thorough list of fragrance COHCs. Assessments that are conducted follow same procedures and standards as described in 2A-C DO LESS HARM levels above. Assures fragrance supplier complies with standards established by IFRA. Complies with laws and regulations in all jurisdictions where products are sold. Assumes fragrance supplier has already assessed ingredient safety, and goes no further. 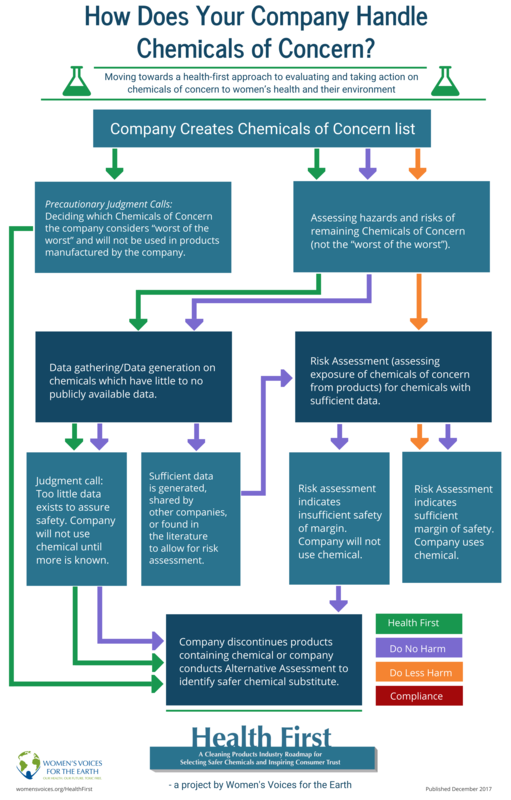 This section looks at whether companies publicly share information about their safer chemicals policies, practices, and criteria. The Chemical Footprint Project is a third-party, industry-friendly, and NGO-supported tool available to measure a company’s use of chemicals of high concern. When companies choose to make their survey responses and score public, this is another way to approach transparency in this arena. Public disclosure of information about a company’s chemical screening process and criteria, and public reporting on measurable progress through annual sustainability reports (or other print or online communications). Also addresses how the company tracks and responds to adverse reactions reported to them by product users, and its willingness to share reports externally. 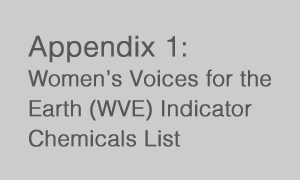 Publishes complete RSL, including an explicit list of prohibited chemicals, and thresholds at which chemicals are restricted. Makes public its hazard and exposure assessment processes, standards, and testing data. Company safer chemicals policy is publicly available and EITHER restricted substance list (RSL) is publicly available OR company annually publicly reports on metrics in implementing its safer chemicals policy. (As per Mind the Store retailer scorecard, metrics may include quantifying reductions of COHC by weight, number or percent of products containing COHC, and/or number or percent of suppliers selling products containing COHC). Makes public its system for cataloguing adverse reactions experienced by product users, and shares adverse reaction reports to select third parties. Company safer chemicals policy and a short list of prohibited or restricted ingredients is publicly available. Company commits to publicly disclose its complete Restricted Substance List within 1-2 years. Makes public its system for cataloguing adverse reactions experienced by product users, but does not share adverse reaction reports externally. Does not have or does not publicly disclose its chemicals policy for reducing chemicals of high concern. Does not have or does not make public its system for cataloguing adverse reactions reported by product users. Does not share adverse reactions reports externally. Measuring a company’s use of chemicals of high concern in products and progress towards using safer alternatives. This includes participating in the Chemical Footprint Project (CFP) survey, and making the information public. Completes Chemical Footprint Project survey and publicly reports on score and survey response as well as goals and progress towards reducing its chemical footprint. Develops own method for measuring its chemical footprint and publicly reports on goals and progress towards reducing its chemical footprint (e.g. Walmart). Measures its chemical footprint, either using Chemical Footprint Project survey or its own method, but does not report publicly on goals or progress. Does not take steps to measure or reduce its chemical footprint. This section highlights the importance of collaboration among companies that manufacture cleaning products. Such collaborations as the Zero Discharge of Hazardous Chemicals initiatives are included here as the model, where members share the goal of eliminating the use of hazardous ingredients and the presence of hazardous contaminants. Demonstrable efforts to work collaboratively, share information relevant to chemical screening and safer chemicals, and developing tools and practices that raise the standards across the industry. Does not engage in any of the above activities.